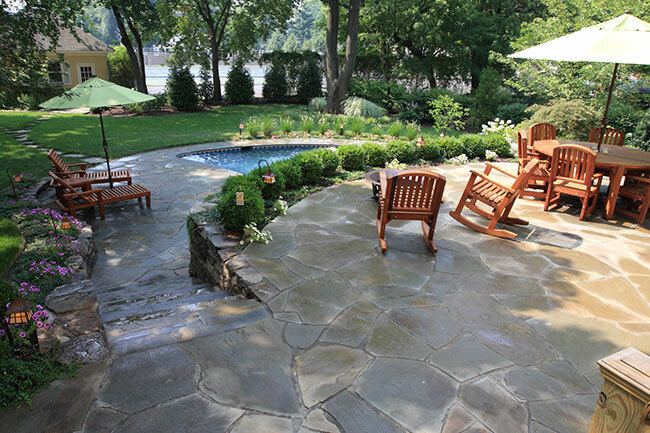 Company: Ledden Palimeno Landscape Co., Sewell, N.J. 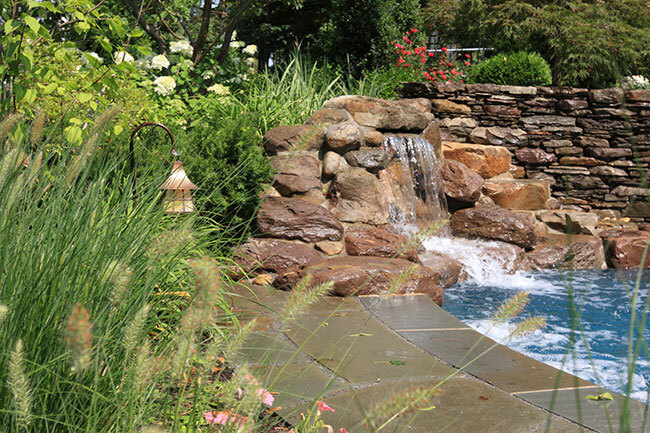 The clients wanted a small plunge pool to take on the feel of a pond, with strong elements of rock walls and bluestone terracing. It had to blend seamlessly into the surrounding landscape and century-old residence. Access was limited, so small equipment was needed. The mature trees needed to be protected and not encroached upon. 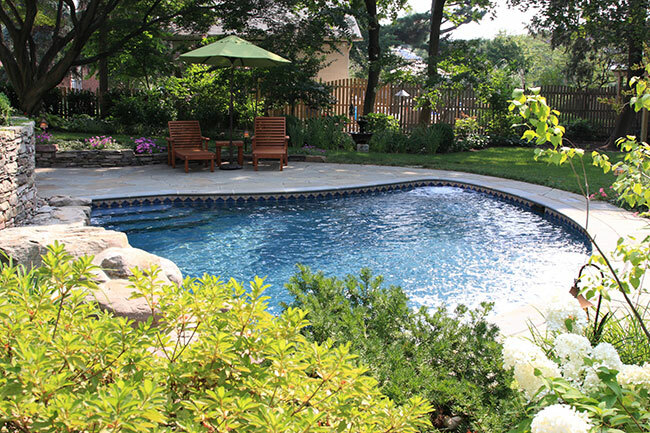 The shape and size of the pool was bound by the surrounding tree root zone, so the pool had to be closer to the house—creating the need for a larger retaining wall. Because the team built a dry stacked wall, a concrete block wall grouted solid was installed behind it to retain the upper terrace. Weather was a challenge, so the team tented the project at times to stay on schedule. 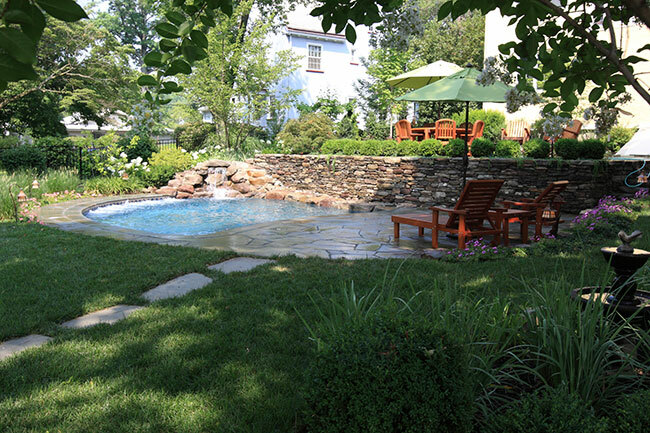 The project earned Ledden Palimeno Landscape Co. a 2016 Grand Award from the National Association of Landscape Professionals’ Awards of Excellence program. 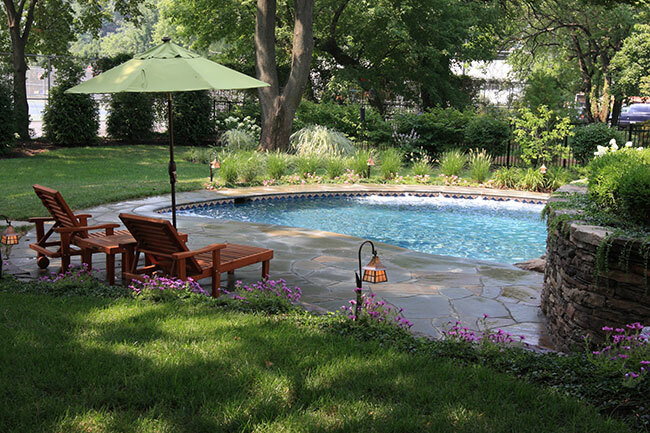 Photo credit: Ledden Palimeno Landscape Co. 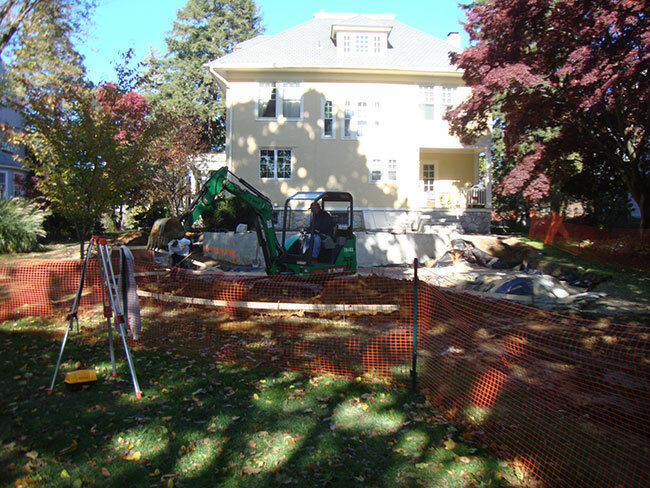 Working around mature trees to ensure they would survive and flourish in this 100-year-old historic property was a challenge. 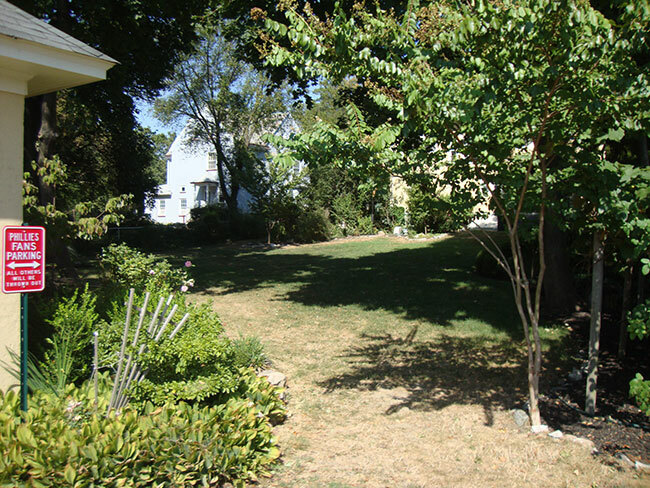 This “before” picture of the yard was taken from the rear driveway. 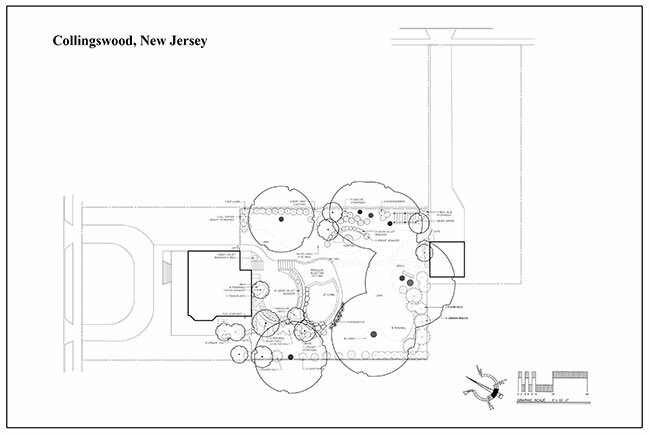 Small equipment was necessary to work in close proximity to existing mature trees. 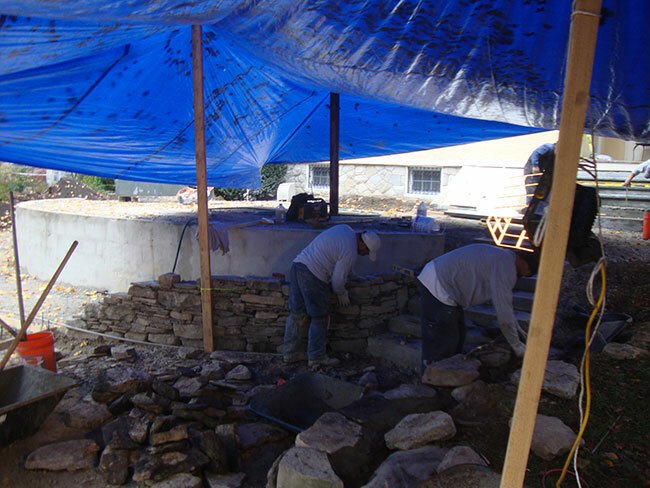 A retaining wall with footings and concrete masonry units (CMUs) were necessary to separate the two grades and allow for a non-load-bearing fieldstone wall to be installed. 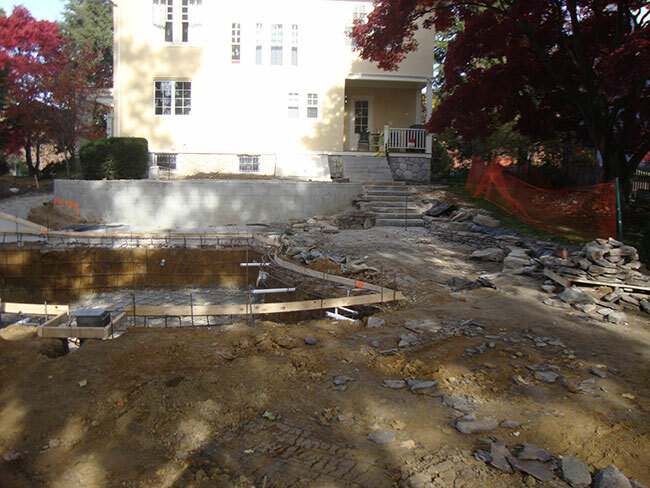 The structure and grades are all in place and ready for the next step of fieldstone wall and bluestone decking. Weather was a challenge. 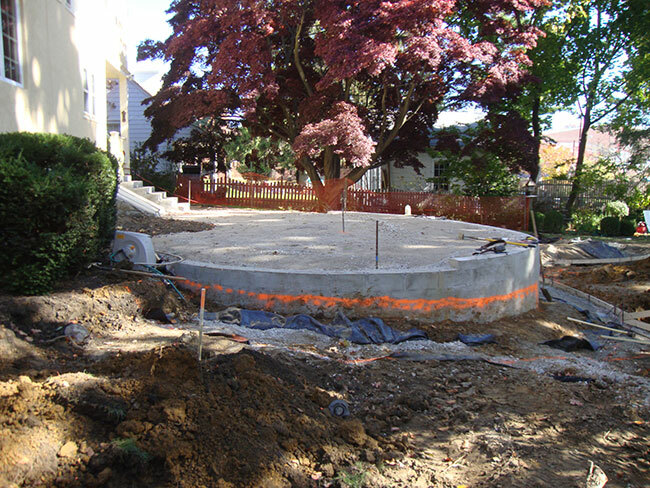 The tenting allowed the team to stay on schedule to complete this project on time. 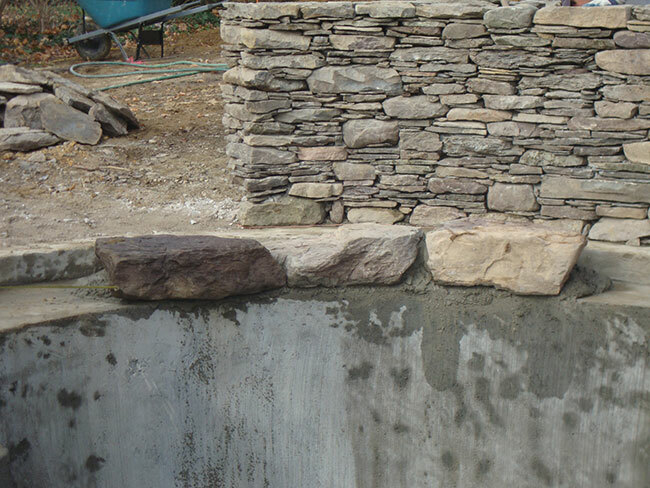 Large fieldstone boulders are set to serve as pool coping along the bottom of the fieldstone walls. 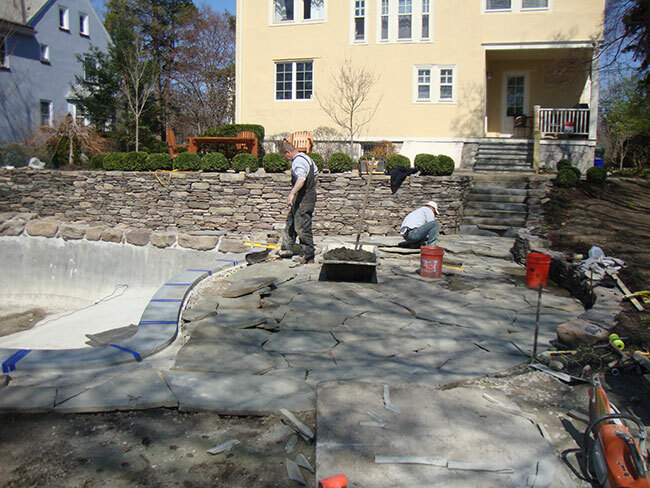 Bluestone decking and coping were all dry-fit prior to cementing them in place. 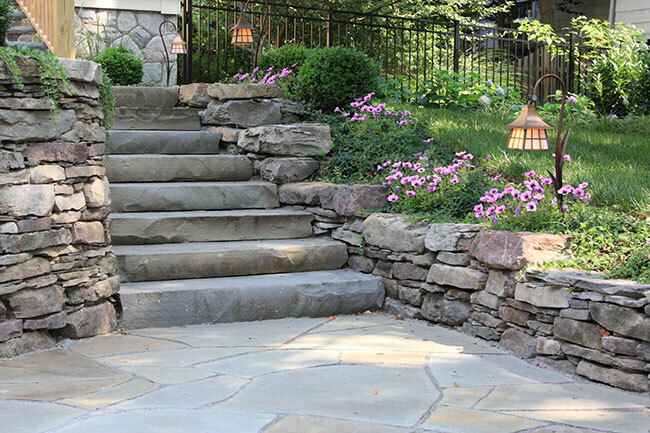 Stone steps and fieldstone walls, softened by delicate plantings, dramatically lead up toward the lounge. 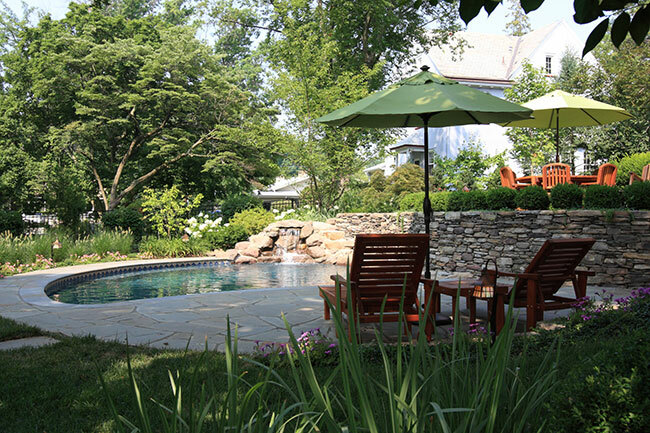 Upper and lower bluestone terraces with plantings wrap themselves around this intimate garden. The serene sound of a waterfall provides relaxation. 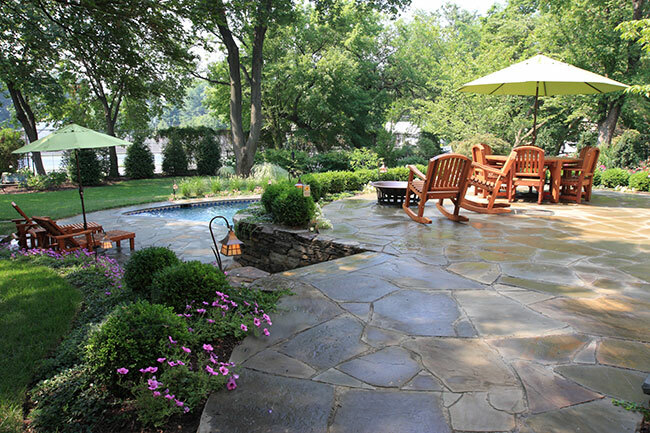 The upper terrace serves as both a dining and fire pit gathering area. Low-voltage copper and glass path lights provide elegance, even during the day. Looking from water feature over the pool toward the lounge area, note the spa jets in the deep-end bench. Looking across the bluestone deck toward the water feature.